A study visit to the city of Zagreb was realized within the regional project “Energy efficiency in Municipal Associations”, from 19 to 24 July 2015. Participants were the project coordinators from partner associations on the project from Montenegro, Bosnia and Herzegovina, Serbian Republic, Serbia, Macedonia and Kosovo, as well as representatives of GIZ, which financially supports the implementation of the project. In the study visit to the city of Zagreb took part Ms. Ivana Lalevic, coordinator of the project on the behalf of the Union of Municipalities. 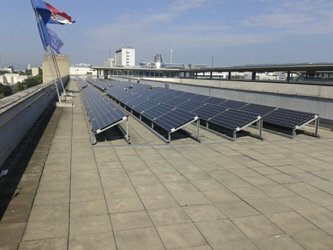 The first day of the study visit, participants visited an energy efficient administrative building of the City of Zagreb, where on the building roof solar panels and collectors for electricity generation are installed. A visit to the Office for Energy, Environment and Sustainable Development of the City of Zagreb also was organized, where participants presented the experiences and barriers in data collection in the preparation of the Action Plan for Sustainable Energy (SEAP), as well as the difficulties in implementing the measures prescribed by the SEAP. Experiences in promotional activities organization were presented in order to raise public awareness on the importance of energy efficiency measures that directly affect the quality of citizen life. The promotional activities in kindergartens, elementary and secondary schools that have had good results in the dissemination of information on the benefits arising from the implementation of energy efficiency measures were especially presented. Municipal associations’ representatives from the region have visited the Association of Croatian cities, and in constructive conversation have exchanged experiences in various fields of activities and the challenges faced by associations in their daily work. The second day was devoted to the Ivanic grad visit, as an example of a city that successfully implementing the SEAP measures and has a well-organized and active Office of Energy Efficiency. Participants have visited Poljane – low energy settlement, where all houses and kindergarten use solar energy as a measure to increase energy efficiency in households. Within the program, the participants have visited the Fund for Environmental Protection and Energy Efficiency, where they met with the possibilities for subsidies in the implementation of energy efficiency measures. The incentives for local governments in the preparation and development of SEAP, as well as in the implementation of concrete measures envisaged in this plan were especially introduced to the participants. The study visit was rated as extremely useful by participants for their future work.